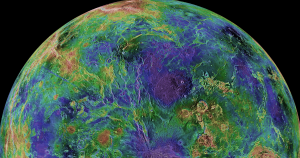 You probably learned in school — or space camp — that Venus is Earth’s closest planetary neighbor. Ready to get your mind blown? A new model of the planets’ orbit shuffles things around, calculating that Earth’s closest neighbor, on average, is actually Mercury. In fact, it says that every other planet in the solar system’s nearest neighbor is Mercury as well. Sure, Venus comes closer to Earth than Mercury, but it also spends a lot of time on the opposite side of the sun. Scientists from NASA, Los Alamos National Lab, and the U.S. Army put together a new model published Tuesday in Physics Today that breaks down the average distance among planets — and it turns out that they’re all, on average, closest to Mercury. The team built an animation showing how even though Earth and Venus briefly pass each other, Mercury’s close proximity to the sun meant that its nearest and farthest distances from Earth weren’t that different. It’s that tight orbit around the sun which, when averaging out all the distances between the planets, keep Mercury from ever getting too far away from any given planet. Sure, this doesn’t change much. The planets are still in the same order that they were in when you learned about them as a kid, in terms of orbits. But if you want to blow someone’s mind — or maybe bore them with math — at Happy Hour, you can whip out some nifty new space trivia about the solar system\.